The Corson Building opened its doors as a restaurant in 2008. Originally built in the first part of the last century, the building was constructed as a home. Initially intended as such, we have honored that mentality in its current incarnation as an eatery as well as an event space. Anchored by a deep respect and connection for this magnificent region we call home, we strive to offer a dining experience unique to the Pacific Northwest. Inspired by the natural abundance that surrounds us and the dynamic and vibrant city we live in, The Corson Building is designed to celebrate all that these things have to offer. The ever-changing bounty of our local ecosystem—in concert with thoughtfully sourced ingredients from afar—are the backbone of what we do. Our food and beverage menus are wholly inspired by years of building relationships with the farmers, wine makers, importers, foragers and artisans that we love, honor and respect. 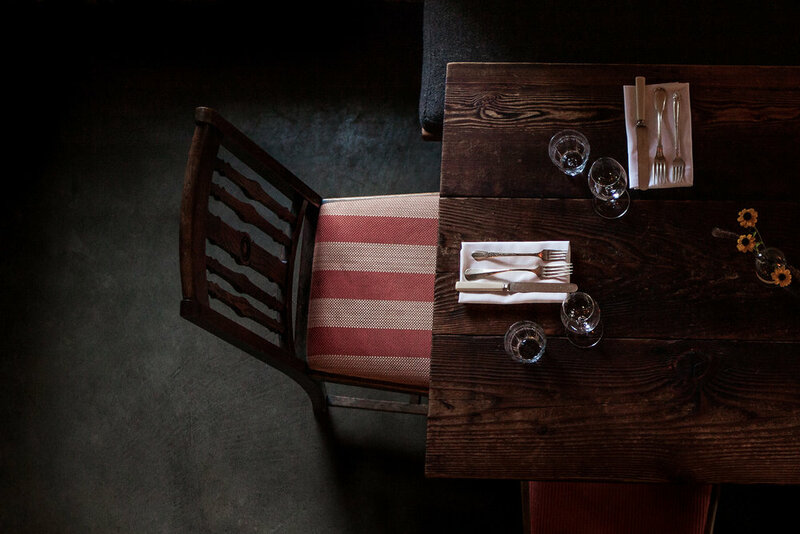 Our dining room is the original footprint of the house and consists of three communal tables initially designed to accommodate our family-style dinners. Now, along with our single seating, shared dinners on Saturdays and Sundays, we also offer a more traditional a la carte style menu on Thursday and Friday evenings. Featuring an ever-changing menu inspired by the whims of the season. This menu is served a la carte. Walk-in or make a reservation via phone or on-line. An elegant feast, consisting of four to five rounds of food, some served to share, some individually plated. Crafted from the bounty and inspiration of the moment. Optional beverage pairing available - $50. Please reserve in advance via phone or on-line. $80 - A pared down version of our Saturday evenings. Akin to a simple family supper and price includes beverages. Please reserve in advance via phone or on-line.